President Donald Trump sent out a forceful tweet late on July 22 in response to threatening remarks made earlier that day by Iranian President Hassan Rouhani. Rouhani addressed Trump on July 22 during a meeting with top Iranian diplomats. “Mr. Trump! We are the people of dignity and guarantor of security of the waterway of the region throughout the history. Don’t play with the lion’s tail; you will regret it,” Rouhani said, as reported by the Iranian state-sponsored ISNA news agency. Trump responded with a rare, almost fully capitalized tweet addressed directly to Rouhani. Trump’s national security adviser, John Bolton, told reporters on July 23 that the president is ready to act. “I spoke to the president over the last several days, and President Trump told me that if Iran does anything at all to the negative, they will pay a price like few countries have ever paid before,” he said. Iran’s foreign minister responded on Twitter, saying Iran was “unimpressed” by Trump’s comments, as Trump had used even harsher words toward the North Korean regime. “We’ve been around for millennia & seen fall of empires, incl[uding] our own, which lasted more than the life of some countries. Be cautious!” he said. U.S. State Secretary Mike Pompeo addressed Iran on July 22 at the Ronald Reagan Presidential Library in California, speaking to an audience that included many Iranian Americans. The former CIA director comprehensively critiqued the Iranian regime, calling out several officials by name, starting with the head of Iran’s judiciary, Sadeq Larijani. Pompeo said Larijani amassed a wealth of at least $300 million through embezzling public money. The Trump administration in January sanctioned Larijani for human rights abuses. The state secretary also criticized Iranian Interior Minister Sadeq Mahsouli, who, Pompeo said, is also called “the Billionaire General,” because he’s worth billions of dollars thanks to contracts with businesses associated with Iran’s Islamic Revolutionary Guard Corps (IRGC), a military branch under the command of Iran’s Ayatollah Ali Khamenei. Khamenei himself, Pompeo noted, controls the sprawling Setad organization with $95 billion in assets. Setad “holds stakes in nearly every sector of Iranian industry, including finance, oil, telecommunications, the production of birth-control pills, and even ostrich farming,” according to a 2013 Reuters investigative report. “That wealth is untaxed, it is ill-gotten, and it is used as a slush fund for the IRGC,” Pompeo said, before expounding on “the regime’s mission of exporting the [Islamic] revolution” abroad, including financial and material support of terrorists such as Hezbollah, Hamas, Shia militants in Iraq, and the Houthis in Yemen. 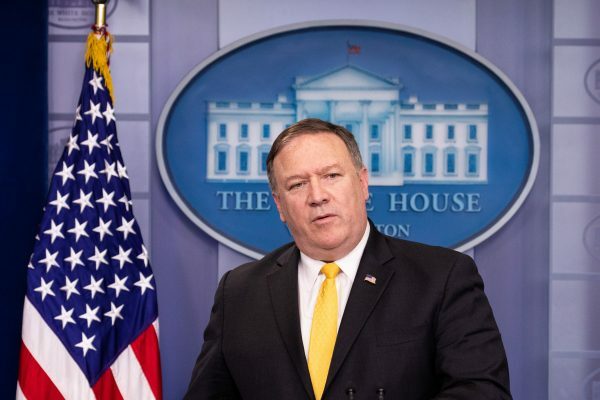 Pompeo then slammed the regime for its intolerance, mentioning the recent case of Maedeh Hojabri, a teenage gymnast arrested and forced to confess to wrongdoing on television after she posted videos of herself dancing on Instagram (dancing is officially forbidden in Iran). He also highlighted the case of a woman sentenced to 20 years in prison for removing her hijab in public. Finally, he expressed the Trump administration’s support for Iranians seeking freedom and Trump’s willingness to talk to Iranian leaders after he sees “demonstrable, tangible, irreversible changes” in the regime. Pompeo mentioned the U.S. government is launching a nonstop, multiplatform Farsi-language news channel, covering television, radio, digital, and social media, “to help Iranians get around internet censorship” imposed by the regime. In response, Iranian Foreign Ministry spokesman Bahram Qassemi accused the United States of interfering with Iran’s internal affairs, saying Pompeo lacked “the necessary knowledge and a deep understanding” of Iranians, ISNA reported. Despite being one of the most oil-rich countries, Iran’s economy has been struggling for years. Iranians blame the government and have come out en masse to protest in recent months. The most recent protests have appeared to focus on a lack of drinking water. Iran’s currency, the rial, traded at less than 10,000 to the dollar a decade ago. It now stands at over 43,000 to the dollar, while Iranians buy dollars on the unofficial market for over 80,000 rials, according to a July 2 briefing by Brian Hook, director of policy planning for the U.S. State Department. A third of Iranians live in poverty, Iranian economist Hossein Raghfar told the U.S.-sponsored Radio Farda. The situation may soon worsen as the United States prepares to reimpose sanctions on Iran—first on sectors such as automotive, gold, and other key metals on Aug. 6, then on areas such as energy, petroleum, and banking on Nov. 4. More than 50 international companies, particularly in the financial and energy sectors, have left Iran already, Hook said. Iran is trying to convince countries to find ways around the sanctions, but the United States is simultaneously working to convince countries to do the opposite and target the regime’s oil revenues. “Our focus is to work with countries importing Iranian crude oil to get imports as close to zero as possible by November 4th,” Pompeo said. 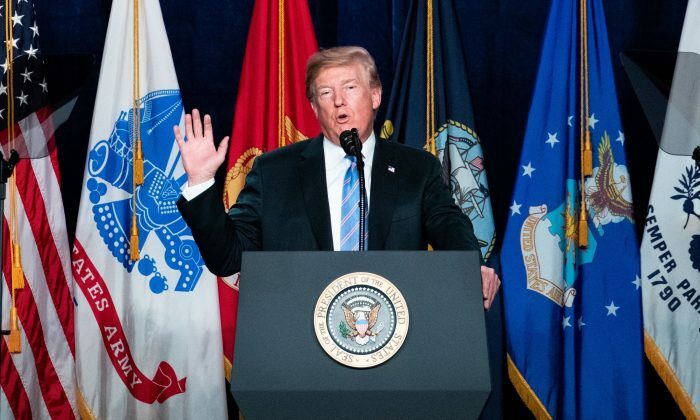 Trump ordered the reimposition of the sanctions on May 8 as he announced the United States’ withdrawal from the Iran nuclear deal. The deal was signed by former President Barack Obama and Russia, China, the United Kingdom, France, and Germany. It delayed Iran’s capacity to enrich enough uranium to build a nuclear weapon to 2026 in exchange for sanctions relief. But Iran went in the opposite direction, announcing last year a 150 percent boost to its military budget.